Thales Alenia Space has signed a contract with ArianeGroup, prime contractor and design authority of Ariane 6, to design, develop, qualify and manufacture the telemetry transmitter of the new European launcher. The telemetry transmitter is responsible for transmitting to the ground the data generated by the launcher throughout the whole launch mission and this is the first contract for the company within the launchers segment. After three decades of activity in the space sector and participation with more than 400 satellites, probes and spacecraft now on orbit, the company is expanding their comprehensive product portfolio in Spain in the field of space communications with a new generation of equipment that is adapted to demanding customer requirements in a highly competitive environment. That environment has driven the company to adopt an innovative design using the most advanced manufacturing technologies. Artistic rendition of the Ariane 64 launch vehicle. The development of Ariane 6 was approved at the European Space Agency (ESA) Ministerial Council in December of 2014 to ensure that Europe maintains its leadership in the fast-changing commercial launch market, while also addressing requirements for European government missions. The launcher will be developed in two versions: Ariane 62, with two solid propellant strap-on boosters, and Ariane 64, with four solid-propellant strap-on boosters. 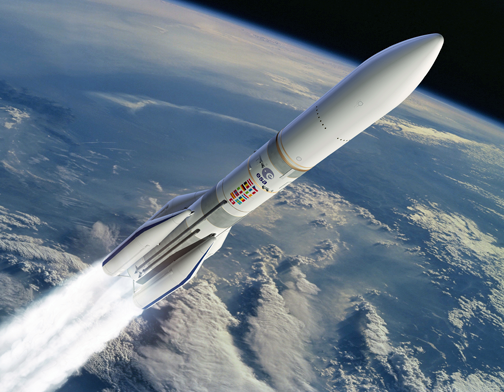 The maiden launch of Ariane 6 is planned for 2020. Thales Alenia Space has contributed to the European launcher industry over the last 40 years as a key supplier of numerous electronic systems that have been developed by the company in Belgium for the entire Ariane family (Ariane 1 to Ariane 6), Vega and Soyuz launchers. Eduardo Bellido, CEO of Thales Alenia Space in Spain, said the firm enjoys the confidence of ArianeGroup and ESA for the development of equipment as critical as the Ariane 6 telemetry transmitter, which is a key program in the European space scene. This contract shows the company's ability to adapt to a continuously evolving space market s well as implementing new industrial processes and technologies to meet our customer needs.